Most microwave manufacturing companies have come up with new models of microwave ovens which come in different colors, sizes and use different technologies to operate. Most of these ovens come with advanced speed-cook modes, interactive recipe databases and all manner of gizmo's. By enlarge these are finished in stainless steel, white or black. So what if you want a stylish red color to complement your kitchen décor as well as options on varying sizes which enable them to be used on the countertop or over the range? Red microwave ovens come with a number of features which include a power rating (which mostly ranges from 600-1200 watts), a sensor which updates you when food is ready, some shortcut keys for fast heating, pre-heating and the de-frosting of your food as well as removable racks which are dishwasher-safe. If you don't want to read through the full review have a look at the table below which gives you all the vital information about these 3 red microwave ovens. 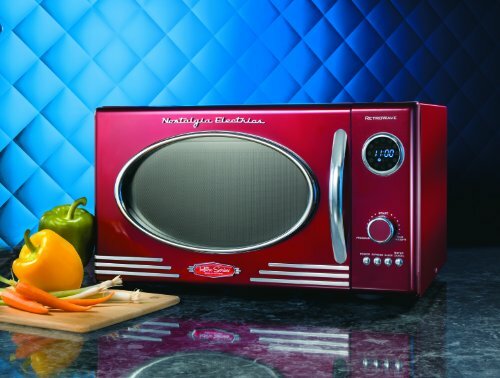 21.6 x 17.9 x 12.9 "
23 x 17 x 13 "
18 x 14.2 x 10.2 "
The Nostalgia Microwave Oven Red is a new chrome and red retro microwave unit which will complement your kitchen décor especially if you’re trying to achieve a 50’s style. Powered with an 800 watt motor, this stylish unit has 12 pre-programmed settings which are able to prepare a variety of different food. Among the brilliant features available with this classy red microwave oven include an oval window and chrome accents, an LED display with a digital clock, a large turntable and a .9 cubic foot interior which is able to accommodate a whole chicken without any hassle. The Nostalgia Microwave Oven Red comes with sleek dimensions of 21.6×17.9×12.9 inches and a weight of 30.7 pounds. See the Nostalgia in operation in the brief video below. 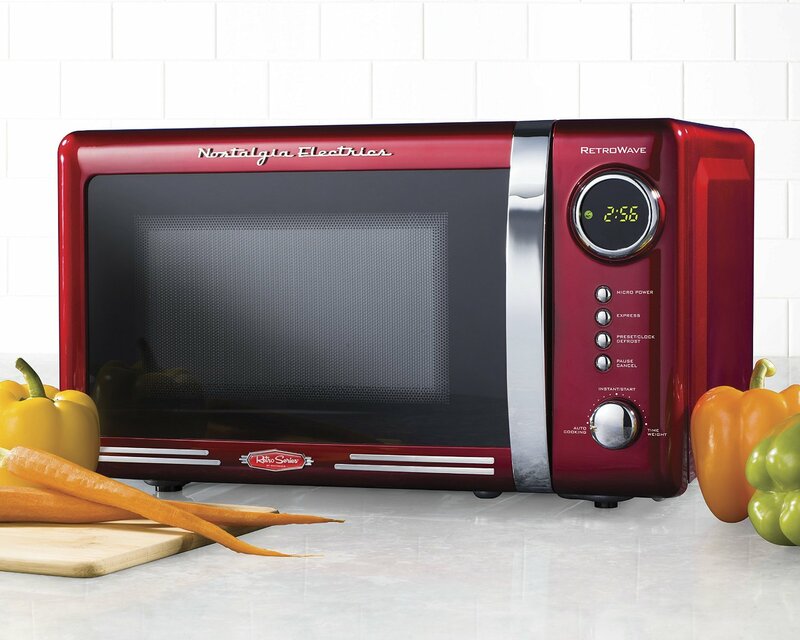 Overall, the Nostalgia Microwave Oven Red is a small-sized unit which is ideal for people living in small apartments or those looking for smaller alternatives. With smart features which include 12 pre-programmed settings, an LED display with a dedicated digital clock and 800 watt heating power which is able to prepare a variety of food and recipes. This is a must-have kitchen appliance for any retro kitchen and cooking enthusiast. The RCA RED Countertop Microwave is another perfect kitchen appliance which is not only stylish but also comes with brilliant features which keeps it at the top of the competition. This microwave is powered with a 1000 watt heater which has a 1.1 cubic foot capacity – enough to heat and pre-heat a wide array of food and recipes. It has touchpad controls, 10 powerful levels and 6 program settings which ensure that you achieve precise results. 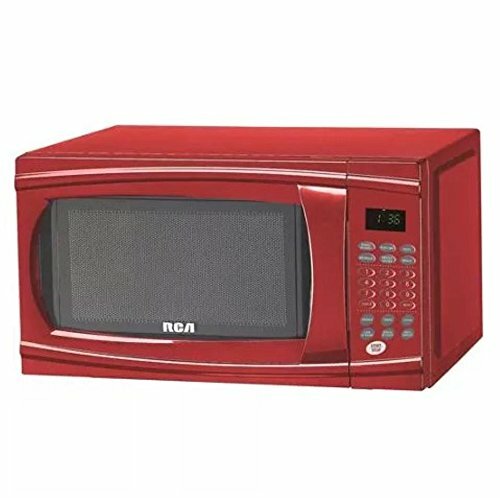 The RCA RED Countertop Microwave is able to cook full meals, pre-heat leftovers, cook bacon and quickly defrost your meat to prepare your dinner in a hurry. This red microwave oven comes with a light weight of 36 pounds and dimensions of 23×17×13 inches. Something which has really made the RCA RED Countertop Microwave win a large multitude of customers is its price and the sleek design. This microwave comes with a pocket-friendly price and a stylish, sleek design which fits in with small kitchens effortlessly. Most customers have praised its features which include a touchpad control, a digital clock timer, 6 program settings and a 1000 watt heater which can cook and heat a wide variety of food and recipes. 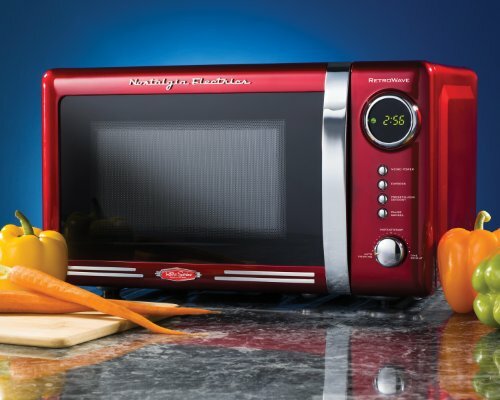 Which Is The Best Red Microwave Oven on Test? By evaluating customer reviews and with our thorough knowledge of microwaves, the Nostalgia Retro Red Microwave Oven has great features and benefits which puts it at the top of the pile in this review. This unit has an LED display, a digital clock, 12 pre-programmed settings and a stylish oval window. It’s not quite as powerful as the RCA but the 800 watt rating is ample for a unit that probably won’t be the primary cooking equipment in your kitchen. It will also complement any other red accessories or consumer electronics you have in your kitchen. Especially if they’re retro styled. The RCA RED Countertop Microwave is the second in the list. Among the brilliant features which put it at a close run second are a 1000 watt rating, touchpad controls, 10 powerful levels and 6 program settings. This microwave is able to cook full meals, pre-heat leftovers, cook bacon and quickly defrost your meat to help prepare your dinner in a jiffy. The Nostalgia Electrics Countertop Microwave Oven is the last unit in the list despite sharing similar retro stylings with the more powerful Nostalgia model on test. This oven does have smart features which include; 12 pre-programmed settings, an LED display with a digital clock, a capacity of 0.7 cubic feet and a 90 days limited warranty giving you value for money with your purchase. The lower power rating of 700 watts and tiny difficult to read buttons is ultimately what puts it in third spot though. It’s worth pointing out that the manufacturers warranty on all of these 3 options is limited to 90 days. For piece of mind it might be worth opting for an aftermarket warranty. Amazon for example offer 2 year protection for less than $3.